.They are known in Turkish football circles as the ‘Lion’ and this they showed when they humiliated MKE Ankaragücü 6-0 during a home match. 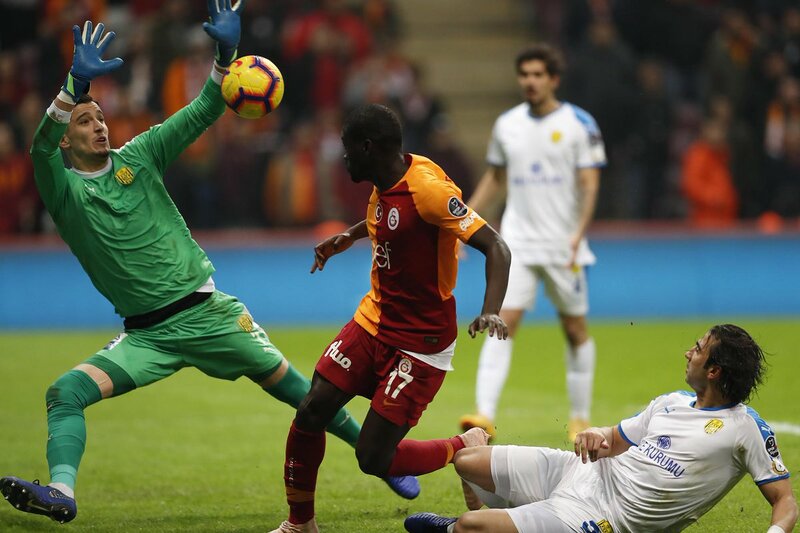 It was the 18th week of the Turkish Spor Toto Super League where Lion, made their fans happy with a hat trick by Henry Onyekuru, while Sinan Gümüş earned a brace and Badou Ndiaye scored one, all for Galatasaray on Saturday. Galatasaray bombarded MKE Ankaragücü, a team of the Turkish capital city with its three strikers. A key highlight was a beauty of a goal that was netted by Ndiaye. Newly-transferred Marcao played a full ninety minutes while Emre came in as a substitute in the 71st minute, during a highly entertaining match. In the 18th week of the matches, the Ankaragücü team was embarrassed with the dozen goals, leaving a grin of disappointment among their supporters. Starting the match in a very speedy way, there was a scramble in the penalty area where Onyekuru’s shot was blocked by Ankaragücü’s defenders. The first goal came in at 52 seconds, through Gümüş’ boot. Nine minutes later, Belhanda’s powerful shot was blocked in the penalty area by the defence, the ball was volleyed by Onyekuru but it went out. Meanwhile, a harsh tackle by Pinto in the 14th minute increased tension among players. Following this, Pinto and Belhanda were shown yellow cards. Following the yellow cards, the two will miss next week’s matches. Taking the pass from Ndiaye, Onyekuru made the score 2-0 with an amazing shot in the 22nd minute. After 26 minutes of play, Mariano passed the ball to Gümüş from the right wing, the latter scored his second and third goal for his team. The first half ended at 3-0, in favour of Galatasaray. When Ankaragücü lost the ball at the 59th minute, Galatasaray started to attack and was rewarded with its fourth goal. It was a goal by Onyekuru, after a perfect pass from Fernando. At the 63rd minute, Onyekuru got his hat-trick when Feghouli moved the ball from the right wing and shot it in the middle of the field. In the virtue of this splendid goal, Galatasaray made it 5-0. As the breathtaking match went on, Mariano Mariano left the ball to Yunus Akgün but his shot was blocked by the defence. Ndiaye got on the scorers’ sheet with an astonishing goal, now securing the 6-0 final score. With this win, Galatasaray increased their points to 32 in Sport Toto League and is now at second place. Ankaragücü only has 20 points. Because of the yellow card, Belhanda will miss the Göztepe match, to be played next match.